On a hill to the SSE of Calanais (Callanish I), is Garynahine or Ceann Hulavig, Callanish IV. This is a low central stone enclosed in a cairn and surrounded by an oval setting of five uprights. Apart from Callanish I, there are several other circles in the vicinity, as well as other settings of stones, and the four major monuments round the north and east sides of Loch Ceann Hulavig appear from their careful siting to have been intended to be intervisible. 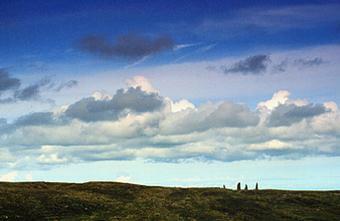 Cnoc Ceann a'Gharaidh and Cnoc Filibhir Bheag are called respectively Callanish II and III. They are situated about 2.1 km NNW from Callanish IV.